Well, my Craigslist dresser is finally finished and I’m excited to show you what I managed to accomplish. Despite some very real fears before I started, I managed to refinish my dresser and didn't have to resort to painting it. In case you missed my original post waaaayyyy back in October, here is what it looked like when I got it. 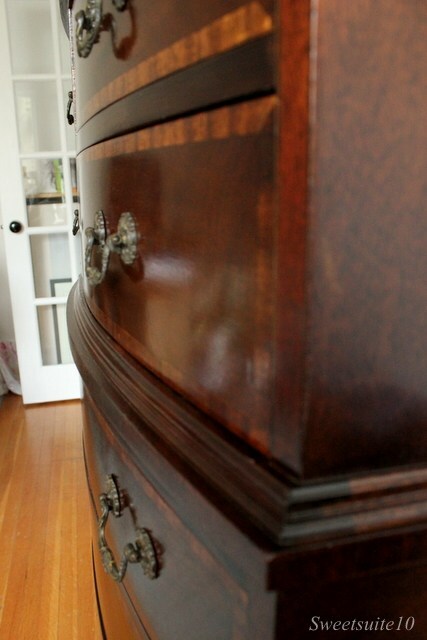 It had great bones, but the missing veneer and other dings and scratches left the dresser looking very old and tired. The first thing I did was remove the entire front strip of veneer that was damaged. This was actually quite easy – I simply used a damp cloth to lay over the veneer, and then passed my hot iron over the cloth to moisten the glue. I then used a small putty knife to lift off the veneer. While the veneer did break up during this process I wasn’t concerned about it breaking as I wanted it all removed anyway. My next step was stripping the old varnish from the dresser. I’d never done anything like this before, and it was an adventure to say the least. First up – this is REALLY smelly, so if you’re going to do anything like this get a respirator. I got mine at Home Depot for about $45, and I’m sure I’ll use it for many projects after this one. The chemical stripper I used is Greensolv from Lee Valley Tools. It’s pretty easy to use – just paint it on, let it work and scrape it off. Through trial and error I discovered that a thicker coat works much better, as if you paint it on too thinly it will dry before it has a chance to work. Some of the areas I had to do a second time. This step took me a while as I did each side, the front, top and drawers on different days, and spaced the days out so my apartment didn’t smell like chemicals permanently. 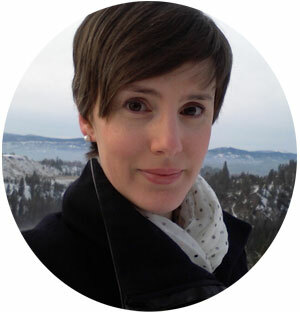 This is when I got my first ever chemical burn – I was wearing gloves as directed, but stupidly wore a short-sleeved t-shirt. As I was scrapping the stripper off the dresser some went flying and landed on my forearm. I wiped it off, but a few seconds later knew that it wasn’t enough, and spent the next 10 minutes running cool tap water over it. Luckily there was no permanent damage, but if I'm ever working with these chemicals again I will remember to wear long sleeves. Chemical burns hurt A LOT, so please if you're ever using these chemicals learn from my mistake. 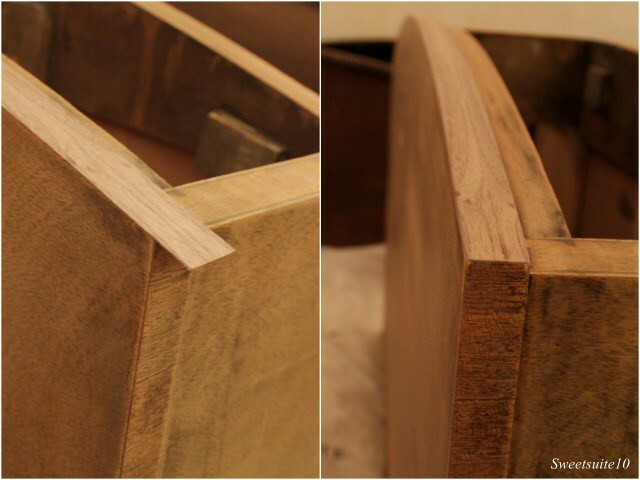 Repairing the missing veneer was incredibly simple. 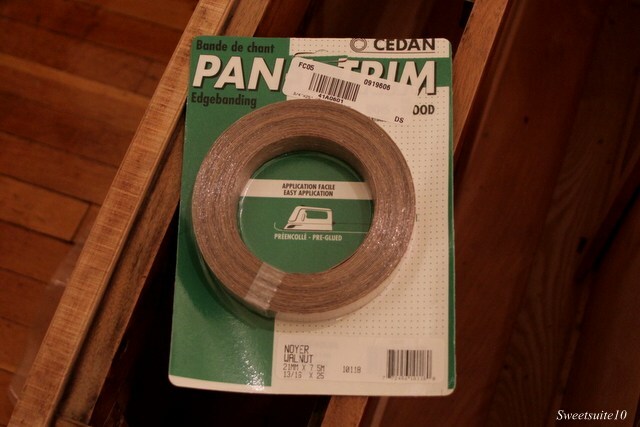 I bought a strip of walnut veneer edge banding from Lee Valley tools, cut the length I needed and applied it. The veneer already has glue on it – all you need to do is lay a clean rag over the veneer, and then heat the veneer using your iron (my iron got more use on this dresser refinishing project than it has ever doing what it’s supposed to - ironing clothes). I had to do this step twice as on my first try the veneer shifted while it was ironing it. Luckily the edge banding is sold in 25’ lengths so I had quite a bit to spare. I also got the second burn of the project during this step - luckily this time it was only from the iron. After the veneer was glued on I trimmed the excess using an xacto knife, and then sanded the edges smooth. I ironed the new veneer in place, trimmed off the excess, and sanded the edges. Next up was my big adventure with sandpaper. 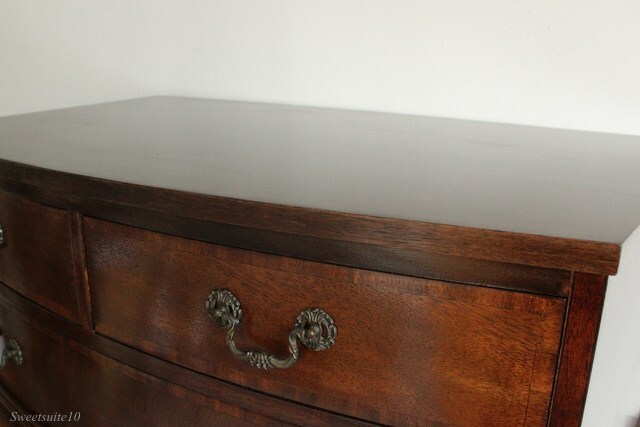 I used fine 220 grit sandpaper over the entire dresser to remove any leftover old varnish, and to smooth any other marks. There were some old long burn marks on the top of the dresser that I believe are from two cigarettes that was left burning. I sanded them as far as I dared, but in the end I was afraid to sand too much in case I went all the way through the veneer. 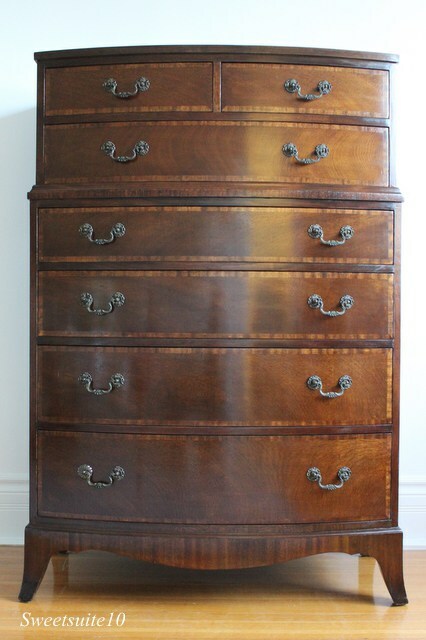 I’ve decided I rather like the marks – it shows that this dresser has a bit of history. Then came the scary part - adding stain. I spent quite a bit of time in the stain aisle at Home Depot debating which shade I wanted. I didn't want anything too red, but I also didn't want anything too dark. Given my inexperience with this type of project in the end I just picked the middle of three shades and hoped for the best. Before adding the stain I gave the dresser a coat of pre-stain wood conditioner. I've never done anything like this before, so I can't tell you if it made any difference over any other project, but I can say that the stain went on my old dresser quite easily and there was no streaking. You just paint on the pre-stain, let it soak in, and wipe off the excess. The directions say to stain within two hours of using the conditioner, and with lots of trepidation I approached my dresser with a foam brush dipped in the stain, and starting applying it. 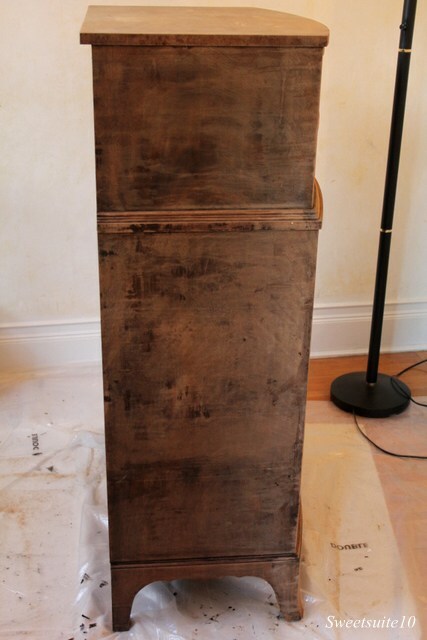 As with the wood conditioner you paint it on, let it soak in, and then rub off the excess with a clean rag. I liked it after the first coat of stain, but I did a second coat to deepen the colour just a little and I liked it even more. After the stain was applied it was time for the protective finish. I used clear Polycrylic in a semi-gloss sheen, and if I were doing it again I'd probably go with a satin finish. This step took a little longer than the stain as I did three coats (sanding with a fine-grade sandpaper between). I found it really hard to get the finish to be perfectly smooth. Try as I might I couldn't get all the brush marks out, but they're only noticeable from an angle in certain light and I'm more than pleased with the finished product. If I hadn't told you I replaced the veneer along the top would you be able to tell? So, what do you think? Was all the work, the fumes, the two burns and months of dodging dresser drawers in my dining room worth it? 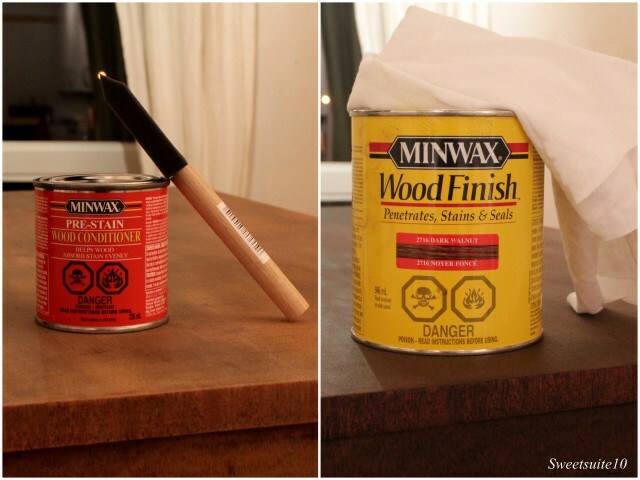 Are you tempted to try your hand at refinishing some furniture? Holy moly! That looks AMAZING!!!! Wow. Michelle, I think you should quit your day job tomorrow and do this for a living. SO impressive! Don't apologize for being proud, you should be! The new veneer blends seemlessly. It is gorgeous! Nothing looks better than really beautifully conditioned and stained wood. Amazing job! This looks fantastic. You really revived this wonderful piece. Beautiful. I think it's bee-yoooo-tee-ful!!! It looks amazing, Michelle, awesome job! It was worth every minute. I love this style of furniture, and you have turned this into a beautiful piece of furniture. Kudos to you!! Way to go! Beautiful payoff for your hard work! Oh, my gosh! I remember it! I had so hoped you wouldn't paint it. And kudos to you for having the guts to jump in and try all these new things. It looks so fantastic. You should be very proud of yourself. I hope its beauty warms your heart every time you look at it! I must admit, it's still a little strange seeing the dresser in my bedroom, but I get a little smile of pride every time I see it. Girl, that is gorgeous!!! Thanks so much for sharing all the steps you had to go through to get the dresser so beautiful. I would be scared like you to put the first brush of stain on the wood after you worked so hard to get the other stain off. Hope nobody else lets their cigarette burn into the refinished wood. I saw your post over at "Flaunt It Friday" blog party. What a lovely dresser and you did such a good job! Thanks for the step by step instructions, I've never tackled a project like this but you have given the confidence to try. It's spectacular! Congrats on such a beautiful job! You did an awesome job! It looks great. Have fun! it's a bt of work, but in the end it's so worth it! that looks beautiful! what a gorgeous piece- you really saved it! Wow!! It turned out great!! No wonder you're proud--you have every right to be! Fantastic job! Did you have to track down the hardware, and if so where did you find it? Actually I was only missing one of the medallions - I had all the rest of the pieces of the handle. All I did was go to Lee Valley Tools and find a pull that had a medallion that matched as closely as possible in size and colour to the originals. I'll keep my eye out for another set of the original hardware, but for now I'm happy with the substitute. Nice, it's not even remotely noticeable that you used a substitute. The Salvage Shop in on Kingston Rd E. has a whack of old hardware (and other cool stuff) , if you're ever in the area. Wow! It looks amazing! All that work totally paid off. Was just introduced to your dresser at Better After and must compliment you on your efforts. 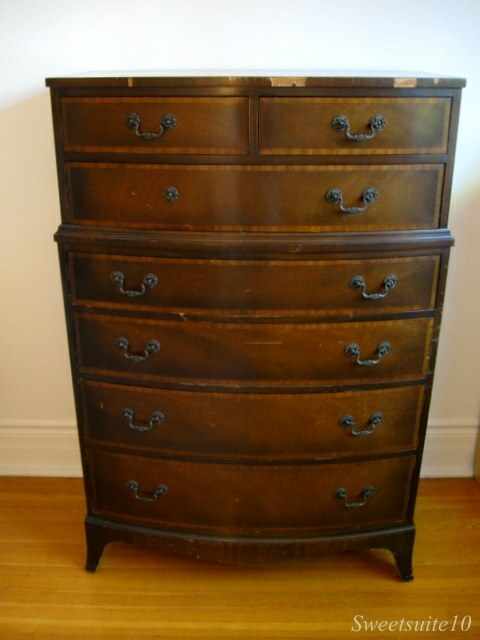 The dresser looks great and inspires me to get to work on the one I have. It's circa 1890, was refinished in the 1970s and that finish has clouded over. Cleaning and waxing have not worked. I see I'll have to use patience for this, but your dresser makes me think I'll be successful with time. Thanks for the detailed description of your work and advice to use a respirator. You're very welcome, and good luck with your project. It is a lot of work, but the results are so worth it! W.O.W! You should be proud... for all the hard work AND for saving such a beautiful piece of furniture. Keep up the great rehabilitations! It's a thing of beauty. Nice restoration job. 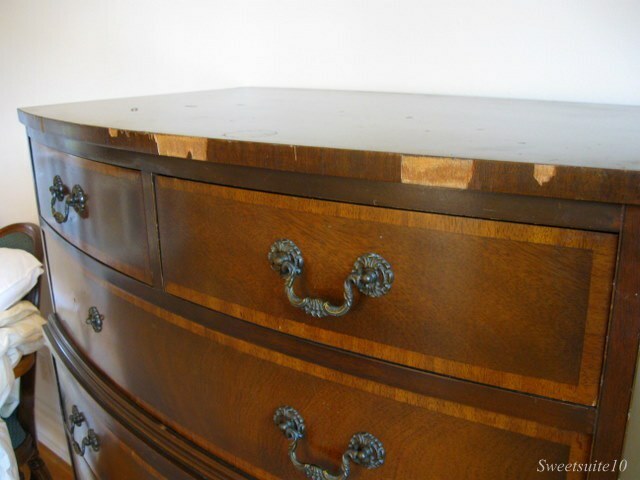 You did such a beautiful job on this dresser! I thought Id commented when I first read this. 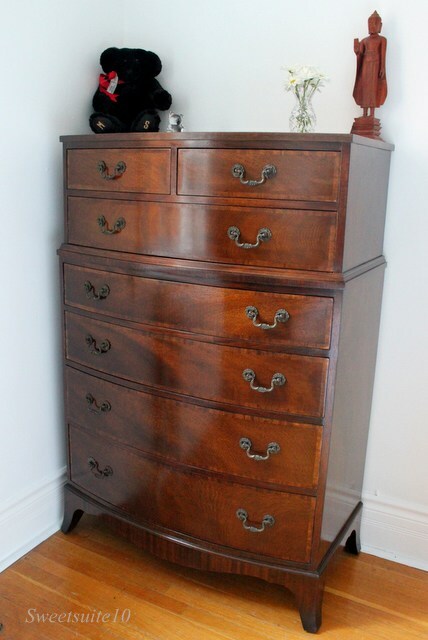 It's a beautiful dresser and you deserve kudos for rescuing it. It's the rare piece of furniture that needs painting and it takes an eye and a bit of determination to bring it back. Very elegant! Hi Michelle! I remember your dresser from back in February (I left a comment on 2/10/12) and have thought about it during the year and what a great job you did when ever I need inspiration for finishing a piece of furniture. I saw you over at CSI project link party. Wow! It turned out fabulous! Great job on the repairs. Its flawless! 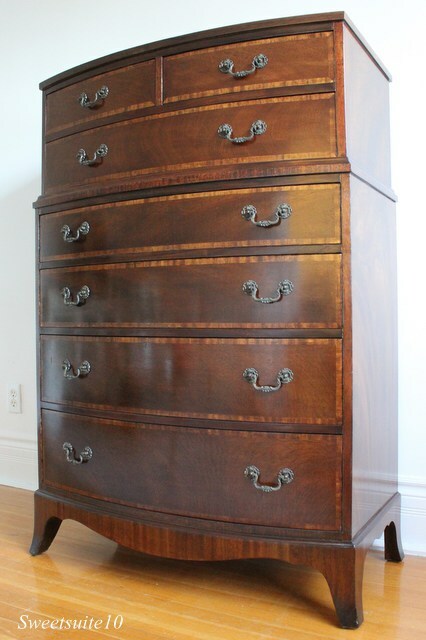 This is a very pretty dresser. It looks brand new! You did an amazing job considering it was your first project! I just had to stop and congratulate you on the A-M-A-Z-I-N-G job you did. I came from AT, from your comment. It was a pretty decent dresser before, but you took the time to bring it back to glory. "This was actually quite easy – I simply used a damp cloth to lay over the veneer, and then passed my hot iron over the cloth to moisten the glue." I have been ironing the heck out of a beautiful veneered table I rescued from beside the road. Got off 80% of it... the rest seems to be glued for eternity. Kudos for that dresser... looks fantastic. I didn't have any trouble with mine, but it might have been the glue that was used on my piece that made it easy. I know some people use a heat gun to help remove veneer, but I'd be a little wary of going that route - scared I'd burn the wood. Is there a woodworking or furniture store near you that you could ask for ideas? I know Lee Valley here has very helpful sales staff that are always willing to give tips. I think if I were in your shoes, and if I couldn't get the veneer bits off I'd probably resort to sanding them. I'd probably start with hand sanding, and then try a palm sander if that didn't work. Nice job!!! Thanks for the inspiration to take on my Summer Project for 2013! p.s. How long did this piece take you to complete? For a big veneer job I'd seek out a professional, but for smaller things like edging it's a lot easier than I though it would be and something I'd encourage others to try - what's the worst that can happen? If you screw it up you can get a professional to fix it, but at least you will have tried! Michelle, this looks terrific. Beautiful piece and amazing re-hab. Well done! Wow! What a beautiful piece - and you have brought it back to life wonderfully! Great job!